There are some vocal sceptics out there that say that global warming is not man made. I find that the majority of these opinions are brought forth by right wing think tanks, and corporate sponsored ‘researchers’. I wouldn’t be surprised if many of these sponsors are oil companies! 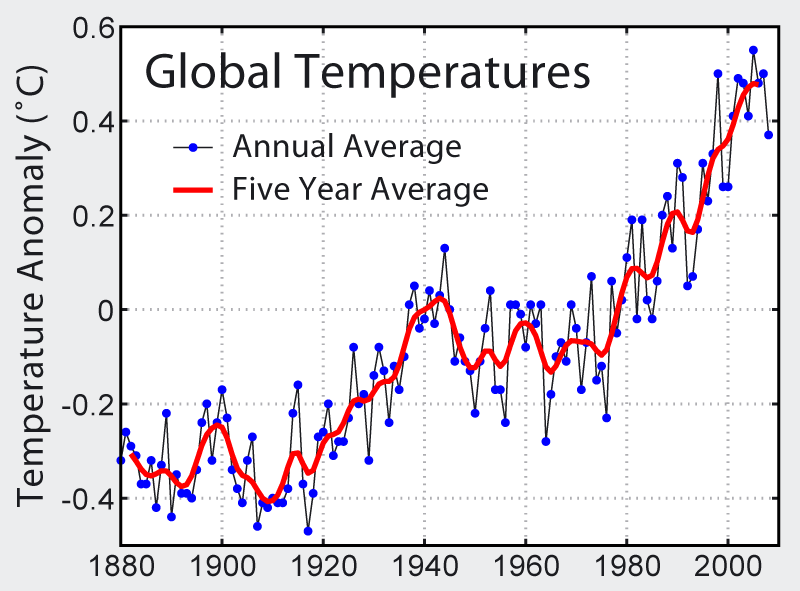 Here is a graph showing temperature flucuations for the last 120 years. Over at Science Centric is a bit more research to add to the mountain of evidence that global warming is being influenced by humans. This is a study about drought in Mexico. The Huffington Post has an article about Obama’s new science advisor John Holdren, who wants to shoot ‘pollution particles’ into the upper atmosphere to reflect the sun’s rays. Crazy? Who am I to judge? What are your thoughts? Do you think humans are wrecking the planet? Drop me a comment. I would love to hear your opinion! The recent spike in pirate activity around Somalia should soon result in a strong decline in global temperatures. Be watching for it. Haha. Good stuff. The Global Warming Theory is very profitable. Look at Copenhagen. Over 1200 Limos required to take deep pockets from luxury hotel suites to meeting hall down the road. Taking plentiful public transit buses or sharing a Taxi was out of the question. Not enough Limos available in Demark, so many had to be driven in from Germany and other European countries. Limos kept nice and warm for passengers. Massive CO2 emissions were never a concern. 140 luxury private jets were used to fly deep pockets to Copenhagen. PM of Britain took a 127 passenger jet to take him and 20 assistants to Copenhagen. Same day Prince Charles took a separate private luxury jet to Copenhagen. I guess the dozen or so commercial flights going to Copenhagen that very same day were for the little tax payers. No concern about massive CO2 emissions and Global Warming.. The Airport in Copenhagen ran out os space to park the Luxury jets. Deep pockets were let out in Copenhagen while Luxury jet were then flown to Norway to park. Global Warming not a problem to them when there are huge sums of money to made. Yes the Global Warming Theory is very profitable – for some. The problem is that the majority of little people will end up filling the deep pockets of the few. Why else spend so much money going to Copenhagen. No one ever asks that question. 20,000 to 34,000 people flew into Copenhagen – could have been more. They also flew out. I guess video conferences were out of the question. You don’t get a free tax payer paid for vacation if you do a video conferences. The UN is paid for by the Tax Payers of the member countries. The politicians dont get a photo-op if video conference were used. Huges Co2 Emissions were not a concern when there are Photo-Ops. How many luxury private jets were flown to Copenhagen by so called Global Warming Theory Deniers? How many of the over 1200 Limos used for the Copenhagen conference were used by so called Global Warming Theory Deniers? Huge amounts of money supports the Global Warming Theory. Why? Because Trillions are to be made from carbon trading schemes. Huge amounts of money are propping up the Global Warming Theory, because if there is no Global Warming then there will be no Carbon Trading. Credit Default Swaps are no more, so they had to invent something new. Carbon Trading will end up being even bigger than the Credit Default Swaps. Wait till that crashes and watch the size of the Government Bailouts which will be demanded. The only good news is that a ton of CO2 Swaps is trading in Chicago at 10 cents per ton. At that rate obscene profits can not be sustained. They want $10 to $20 and more per ton. I hear what you are saying, but the science is there to support global warming. There is still lots to be learned…Debate is healthy. Next PostNext Is Alcoholics Anonymous a cult?